Invite your clients to discover first-hand, the wonders of the Panama Canal � an incomparable engineering feat and once-in-a-lifetime experience. They'll enjoy a thrilling daylight passage through the Gat�n Locks and revel in the elegant comfort of their spacious, mid-sized ship. 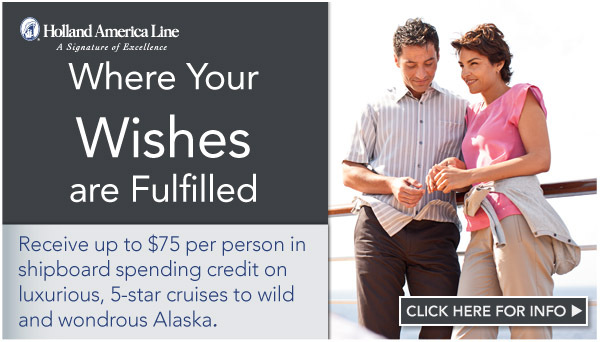 Book your cruise worry free with Holland America Line's Cancellation Protection Plans. For important information on new passport requirements in the Western Hemisphere, click here. *Fuel supplement has been suspended. Holland America Line reserves the right to reinstate the fuel supplement for all guests at up to $9 per person per day should the price of light sweet crude oil according to the NYMEX (New York Mercantile Exchange Index) increase above $70 per barrel. Please consult our website for current information. Fares are based on Promo(s) FL/RH. Featured fares are per person based on double occupancy, cruise or cruisetour only. Fares are in U.S. dollars. All savings amounts are included in fares shown. Government Fees & Taxes are additional and range from $106.20 to $1,187.64. Subject to availability. Third/fourth offer based on sharing a stateroom with 1st and 2nd guests, are valid on select sailings, and are based on Promo Z3. Third/fourth child offer applicable to ages 17 and under. Government Fees & Taxes apply to all 3rd/4th offers. For more information about our stateroom categories and suite descriptions, to view deck plans and for full terms and conditions applicable to your cruise, please refer to www.hollandamerica.com or the appropriate Holland America brochure. Offers are capacity controlled, and may be modified or withdrawn without prior notice. Other restrictions may apply. Ships' Registry: The Netherlands. Please add Holland America to your address book or safe sender list. Don't let your dream cruise leave without you! Copyright © 2013, Vacation.com - All Rights Reserved.